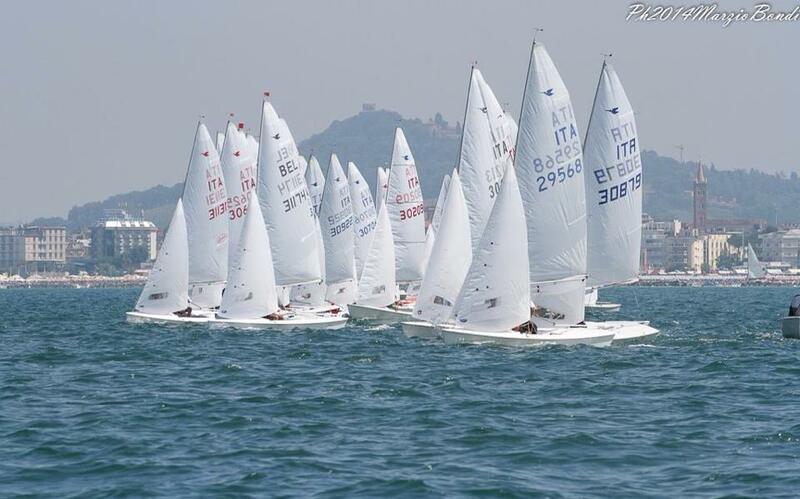 38 boats sailed out of Portoverde under the warm sun of Riccione and gentle breezes of the Adriatic. The mostly all Italian fleet was joined by skipper Manu Hens of Belgium, skipper Steve Lang and crew Tara Levy of St. Petersburg, Florida, USA, skipper Jensen Mc Tighe and crew Brian Buckley of Ft. Lauderdale, Florida, USA, Greg Saldana of Michigan, USA who crewed for Giovanni Stella and Kathleen Tocke of Miami, USA who crewed for Pietro Fantoni. Forecast for the day remained steady with 8-10 knots of shifty winds out of the southeast for both races. Enrico Solerio and Sergio Simonetti placed first, Pietro Fantoni and Kathleen Tocke second, and Paolo Lambertenghi and crew finishing third. Race two: Dario Bruni and Giuseppe Commisso placed first, Fabio Rochelli and Daniela Semec second, and Pietro Fantoni and Kathleen Tocke third. After races on the water, sailors fought for the coveted Go-Kart podium on land. Cheering Snipe sailors enjoyed cold drinks from the observation deck overlooking the course and drivers. Competition on the track was as fierce as it was on the water. Lorenzo “Lollo” Baldi, Manu Hens, Stefano Longhi, Filipo Perdisa, Paolo Lambertenghi and Pietro Fantoni dominating the post regatta event. Day two of the regatta saw three races with winds out of the southeast again at 8-10 knots increasing to 12-15 knots before the end of the day. Race one: Solerio and Simonetti placed first, Longhi and Ruggerio second, and Fantoni and Tocke third. Race two: Solerio and Simonetti again placed first, Fantoni and Tocke second, and Lambertenghi and crew third. Race three: Manu Hens (Belgium) and Enrico Michel (Italy) placed first, Bruni and Commisso second, a!nd Solerio and Simonetti third. After races sailors dined together on a restaurant roof terrace overlooking the Sea and enjoyed fresh green salads, steamed mussels and clams, grilled fish and shrimp. Cold drinks were plentiful. Just when all were satiated and comfortable with conversation, Brazilian SAMBA burst into the scene and became the focal point of the evening. Two magnificently costumed dancers (resembling exotic birds) performed and moved effortlessly to rhythmic beats around the dinner tables looking for prey. Alberto Perdisa, Stefano Longhi, Kathleen Tocke, Pietro Fantoni, Giovanni Stella and Greg Saldana were seduced by the birds to dance. Needless to say, this was quite a scene. Returning to their tables to share laughs and more drinks Snipe sailors would be greeted again not once but two more times by the live Brazilian dancers. During the second dance Stefano Longhi received “special treatment. The Brazilian dancers discarded portions of their costumes and placed them on Stefano. Naturally and without prompting, Stefano responded spontaneously to the dancers with his own “Brazilian moves”. Stefano then seduced Giovanni Stella to continue with his own moves with the crowd laughing all the while. A good time was had by all. Later a live DJ played 1970’s and 80’s dance music and Snipers burned up the wood dance floor into the late hours of the night. Morning winds blew from the land producing “lake like” waveless conditions on the race course. Very puffy and shifty winds blew between 5-18 knots during race one. The sea breeze filled in for the second race averaging 7-10 knots from the southeast. In race one: Hens and Michel placed first, Rochelli and Semec second, and Fantoni and Tocke third. Race two: Fantoni and Tocke placed first, Hens and Michel second, and Solerio and Simonetti third.